Weight is an essential data that customers must monitor over production, quality control and end-product marketing processes. Taking the weight into account in the software used for these operations is therefore a priority. There is no question of a manual data entry (a source of mistake and time waste, incompatible with the real time notion), so a direct connection between the indicator and the client PC is therefore required. In terms of process, field buses make up the most adapted solutions when target systems are programmable PLCs or supervision tools. Widely released and mastered by our developers, these buses offer a fast implementation of the client indicator-system connection. 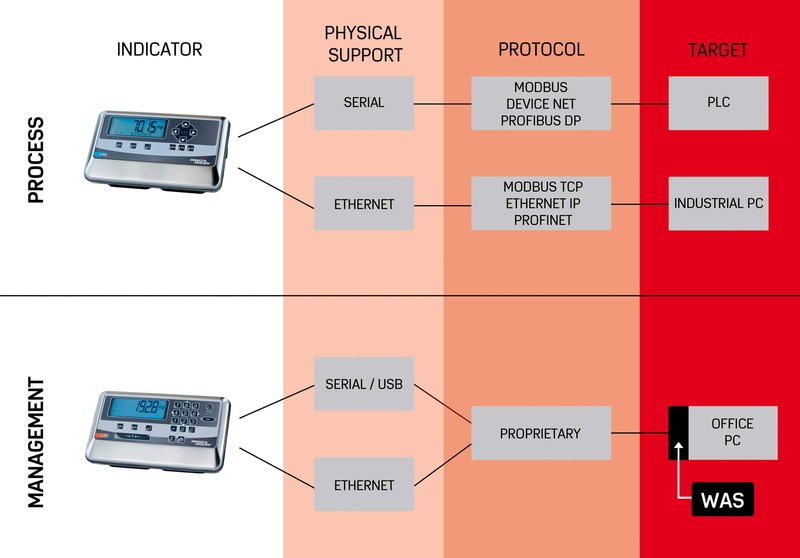 As for management applications, the most common physical supports are the RS232, USB and Ethernet serial ports. However, there is no standard protocol as each manufacturer has developed its own data formatting via “proprietary” protocols. The user will have to develop low-level layered software to secure the interface between the indicator and the used application. As this step can be tricky, the WAS software suite has been developed to perform the weight acquisition and to display it either in an active window of the application or to store it in a file so that it can be processed later on by the customer when and as required by them. Installing WAS is very simple; it follows the common Window application installation procedure. All PRECIA indicators with the A+ protocol are supported. Several indicators can be simultaneously connected, according to a point-to-point or network architecture.